Assassin's Creed II (Neca)In some ways a step forward others a step back from the original entry to the AC series Altair. The renaissance attired Ezio certainly has less cumbersome robes in the way but suffers from stiffer legs meaning less possibility than before. The articulation isn’t any worse but hasn’t improved and some of it is hindered due to larger sleeves on the arms for example. He looks the part, though the ACII hidden blades designed for the new line are terribly made being softer plastic that doesn’t work well. One major issue I have is the lack of any accessories. There were so many weapons in the new game and a basic sword would have been nice. Instead we get two flimsy open hands that look alien and because they are open they can’t hokd anything. Now this is due to getting the hidden blade look but seeing as one hidden blade on the left arm is removable and how he doesn’t have any obvious mechanism on his arm for the hidden blade to exit from it looks a bit out of place. 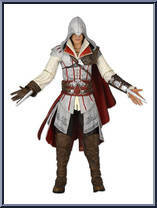 So overall this figure isn’t as good as the Altair and the master assassin Ezio is essentially the same figure.